Breadth across disciplines is seen as foundational: students should be exposed to ways of looking at and studying the world beyond their own disciplinary boundaries. The ability to connect and integrate knowledge across disciplines is crucial. Critical thinking and problem solving skills are emphasized: students need to know how to identify an argument, evaluate evidence and reasoning, produce informed decisions, and communicate and defend those decisions. Education for citizenship, which encourages students to be contributing community members on all levels, and to participate in the running of those communities. Below is a compilation of articles that pertain to liberal education in general, defining what it is and discussing its purpose. Each subsequent pillar subpage has articles that are specifically related to the category. 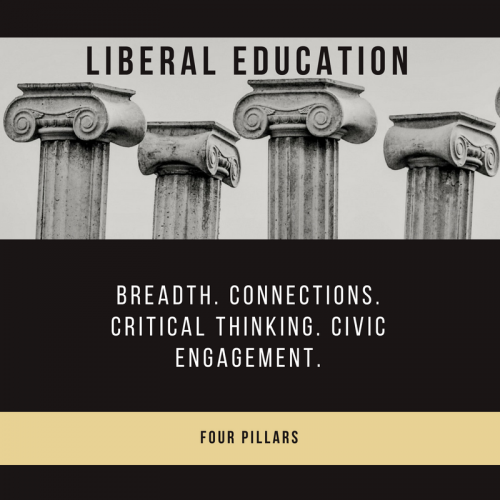 There is a variety of content, opinions, and positions throughout these articles that range from specific liberal education content like critical thinking to how liberal education plays a role in getting a job to "How Robots Will Save Liberal Education". This is a good place to start looking through resources for the essay that needs to be written as well as a place for the curious eye to wander and catch an interesting article to read.